The SWL program helps students undertaking a VET course find work placement with local employers. Find out how you can get involved as an employer. 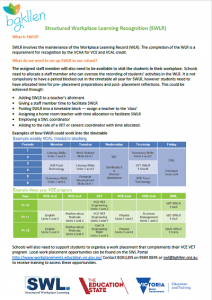 Structured workplace learning (SWL) is on-the-job training that is required to extend classroom learning within a nationally recognised vocational education and training (VET) course, undertaken as part of either the Victorian Certificate of Education (VCE) or the Victorian Certificate of Applied Learning (VCAL). It includes a work placement or a School Based Apprenticeship/Traineeship (SBAT) which allows students to gain real world experience in their chosen course. It offers businesses a chance to raise their profile in the community whilst influencing young people’s career choices. 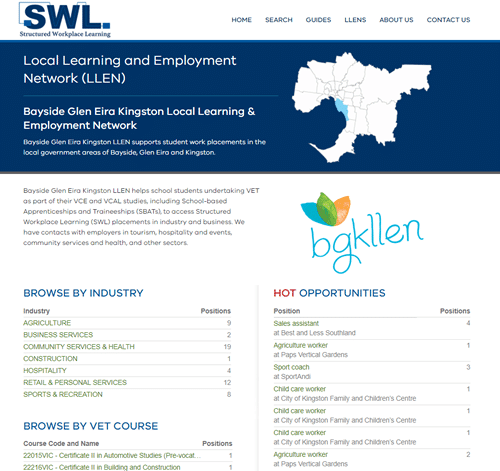 The BGKLLEN work with businesses to develop a placement opportunity advertisement that is made accessible to students across Victoria via the SWL portal.